When planning a Virginia Beach meeting, your venue options are as diverse and unique as your event. Whether planning a citywide conference or a smaller annual meeting, you’re sure to find a space that fits your needs while exceeding your attendee’s expectations. Located just blocks from the Virginia Beach Oceanfront, the Virginia Beach Convention Center, a state-of-the-art facility featuring more than 500,000 sq. ft. of space, continues to elevate industry standards for its efforts on sustainability. 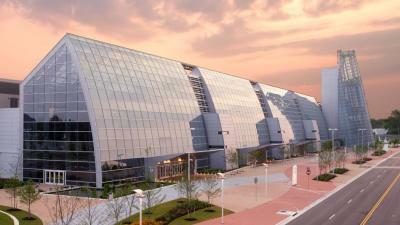 In fact, it was the country’s first convention center to earn LEED® Gold certification. The center includes a customizable exhibit hall, meeting room suites, concessions and pre-function and registration spaces, as well as a garden and locally sourced on-site caterer. Just down the road, the Virginia Aquarium & Marine Science Center provides a distinct meeting space with sea-life accompaniment, set against more than 800,000 gallons of aquatic environments. From an intimate, sit-down dinner for 20 overlooking the salt marsh to a cocktail reception amid sea turtles and sharks for 2,000 attendees, the Virginia Aquarium offers an idyllic ocean-themed backdrop for any event. 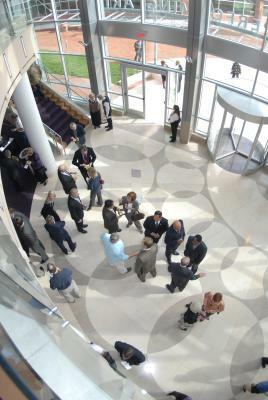 Located just a few minutes away from the oceanfront, Virginia Beach’s Town Center, is where planners will find the region’s premier performing arts facility, the Sandler Center for the Performing Arts, featuring theater-style seating for 1,300 people, while also proudly boasting a grand lobby ideal for catered events. Flanked by grand staircases and illuminated by an exquisite chandelier, the three-story lobby is an ideal place for a banquet or reception. Outside, guests can enjoy a performance in the facility’s outdoor performance plaza, which can accommodate up to 400 people. Town Center also offers upscale shopping, dining and entertainment, providing a dynamic downtown experience. To the north, set against the stunning Chesapeake Bay is the Chesapeake Bay Foundation’s Brock Environmental Center, the most energy-efficient, environmentally smart building in Virginia Beach. With its solar panels, wind turbines, geothermal wells, natural landscaping and more, the center is an international model for energy and water efficiency. The brand-new fully-sustainable center was designed to earn the U.S. Green Building Council&apos;s LEED® Platinum designation and to meet the strict standards of the Living Building Challenge. It also features a large conference room for meetings, discussions and collaboration set against a stunning natural wonder, just a quick boat ride from renowned oyster farms on the Lynnhaven River.